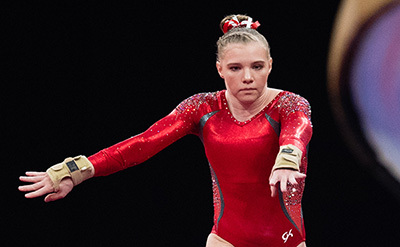 INDIANAPOLIS, Nov. 22, 2018 – Two-time World medalist Jade Carey of Phoenix, Arizona/Arizona Sunrays, qualified for the vault finals at the Turnier der Meister World Cup in Cottbus, Germany, on the first day of qualifications. Carey, along with Trevor Howard of Columbus, Ohio/Ohio State University, and Marvin Kimble of Milwaukee, Wisconsin/Salto Gymnastics Center, will also compete tomorrow on the final day of qualifications. Live scoring is available for all rounds, and U.S.-based fans stream the finals live at 8 a.m. ET on Nov. 24-25 on OlympicChannel.com and can watch same-day coverage of the finals on the Olympic Channel at 8 p.m. ET each day. Held at the Lausitz Arena, the World Cup in Cottbus is an individual event World Cup that is part of the International Gymnastics Federation’s World Cup series, as well as the 2020 Olympic Games qualification process. On the 24th, Carey will compete in the floor exercise final, with Howard competing in both the vault and parallel bars and Marvin Kimble on the horizontal bar. Carey advanced to women’s vault final with a 14.483 average, behind Brazil’s Rebeca Andrade’s 14.766. Uzbekistan’s Oksana Chusovitina was third in qualification with a 14.416. China’s Fan Yilin earned the highest uneven bars score. Howard posted a 14.633 on the still rings, missing eighth place by just 0.033 to finish ninth for the first reserve spot. France’s Samir Ait Said had the top qualifying rings score at 15.066. In the floor exercise qualification, Howard posted a 13.300 (21st), and Israel’s Artem Dolgopyat finished in first. Kimble posted a 10.133 on pommel horse (44th) and a 13.333 for the still rings (19th). Armenia’s Harutyun Merdinyan had the top pommel horse mark. Qualifications wrap up on Nov. 23 at 4:30 p.m. local time, with five event finals at 2 p.m. local time on both Nov. 24-25. The top eight gymnasts for each event in the preliminary round advance to the respective event finals. The events are divided into two groups of five: day one – men’s floor exercise, pommel horse and still rings, and women’s vault and uneven bars; and day two – men’s vault, parallel bars and horizontal bar, and women’s balance beam and floor exercise.